The Slate Caverns Industrial HeritageExperience the Llechwedd Deep Mine and explore the mine's colossal man-made mountains on the Quarry Explorer off road truck tour! Buried deep under the mountains of Snowdonia lies an extraordinary story: it’s a rock revolution that shaped the look and feel of the world as we know it. A way of life which built communities and defined generations of families in North Wales. The Llechwedd Deep Mine Tour tells the story of the men who built this incredible industry which roofed the world. Experienced from the point of view of the mine workers, the tour uses cutting-edge enhanced reality technology, light projections and special effects to tell the story of their blood and guts, their determination and resilience, their risk and endeavour. This is a highly interactive engaging tour which tells us a great deal about how our mining forefathers lived, the importance to them of family, friendship and community, and how their lives have shaped our own – and still do. Look out for Llechwedd's very own slate-cavern-aged cheddar on sale in the gift shop once you complete your tour. The Deep Mine Tour is a 1.5 hour adventure. How do you fancy exploring Llechwedd’s formidable slate mountains with a thrilling guided adventure in a 4 x 4 military truck? Llechwedd’s NEW Quarry Explorer tour complements the deep mine tour perfectly, though it is also a great stand-alone day out too. It's an off-road adventure that will take you right into the heart of Llechwedd’s man-made mountains. Travelling in a converted military 4 x 4 truck you’ll drive up high to the top of the quarry and into some of the massive craters we made by blasting the tops off our hundred-year-old caverns. You’ll learn more about how this amazing landscape was built by the men and boys who worked in Llechwedd’s mines, and why it is now the subject of a UNESCO World Heritage Status bid. You’ll take in views of North Wales like no other and have the opportunity to snap some great photographs. The Quarry Explorer Tour is a 1.5 hour adventure. Experience the Llechwedd Deep Mine and explore the mine's colossal man-made mountains on the Quarry Explorer off road truck tour! 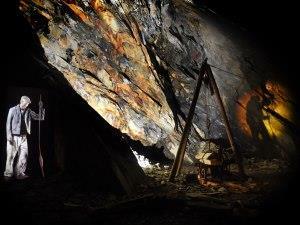 The Slate Caverns are located adjacent to the A470 less than 1 mile north of Blaenau Ffestiniog. The town is approximately 6 miles from the A487/A470 junction to the south and 11 miles from the A470/A5 junction to the north. The Conwy Valley mainline railway terminates here as does the Ffestiniog railway.